This product is a bundle of my 2 best-selling positive affirmations printables, the affirmations for Christian kids & those with anxiety and the affirmations for Christian moms. When you purchase the two together in this bundle, you will get 20% off the total. This downloadable file contains 80 affirmation cards. Some of the cards are general positive messages. 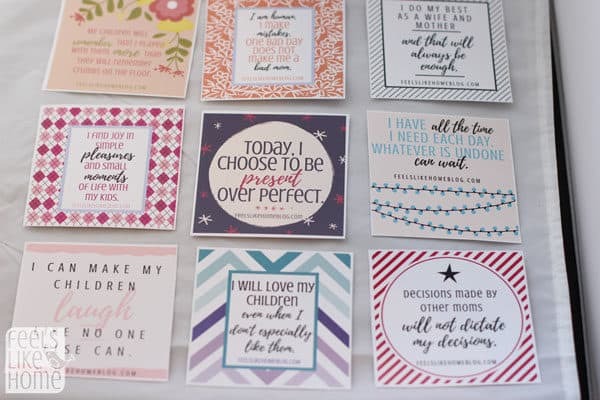 (Things like “every breath I take calms me down” and “I know this will be over soon” and “My future is bright.”) These don't have scripture references because they aren't directly related to any particular scripture. The other cards are directly based on Bible verses. In these cases, the card includes the reference at the bottom for easy study later on. The kids' cards are appropriate for both boys and girls. There is nothing in the text or graphics that would tilt them towards one or the other. The mom cards are, of course, specific to being a wife and mother. There is no reason that any Christian adult wouldn't benefit from the kids' affirmation cards. They are really appropriate for anyone at any stage of life. There is no script font on the cards for kids, but the cards for moms use a combination of print and script. Your kids can totally tip the battle against Satan in their favor, and the Holy Spirit will help them. What can positive affirmations do for my kids? That voice in their heads criticizes your kids. It makes them feel guilty, afraid, angry, and unloved. They constantly worry that they're failing, that their worries are going to overwhelm them, that they aren't good enough. These negative thoughts can have power if you don't help your kids to replace them with positive thoughts – truths based in scripture, written for them by the One who loves them even more than you do. 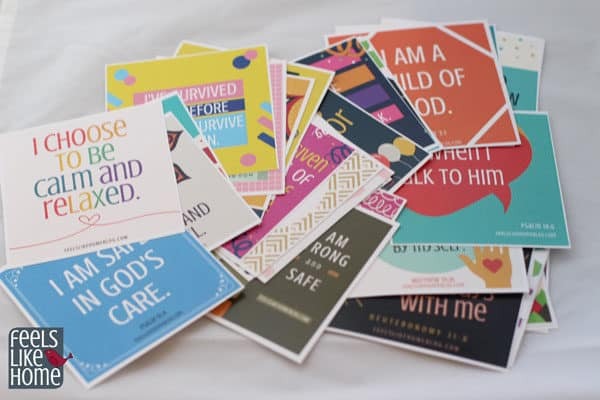 These printable positive affirmations for Christian kids will encourage your kids and lift their mood throughout the day. They will remind your kids to see themselves the way God sees them – calm, beloved, and peaceful children of God. Choose one affirmation to focus on. Your child might want one per day or one per week, or just change it whenever she feels like it. Post somewhere that she will see it several times throughout the day. I like mine on the bathroom mirror, but you could also put it on her desk, the kitchen table, or some other spot. Claim a mindset of joy for your children and take back their minds from the enemy. These cards are the perfect way to build their trust in the Holy Spirit and consciously seek out his voice in their mind. You can protect them against worry and anxiety with God's help.